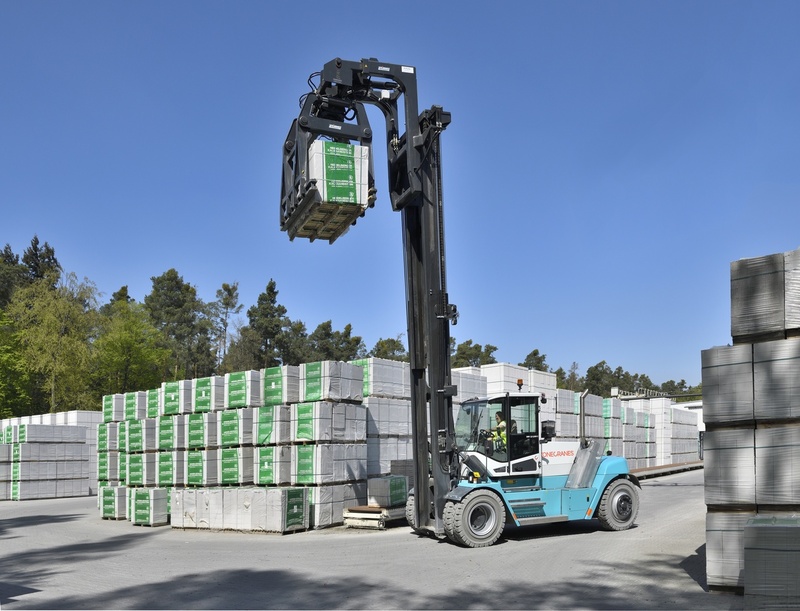 Konecranes Lift Trucks has designed two heavy-duty lift trucks with stone stack gripper for Heidelberger Kalksandstein GmbH in Durmersheim, close to Karlsruhe in Germany. Heidelberger Kalksandstein GmbH, with headquarters in Durmersheim, Baden Württemberg, specializes in the production, support, and distribution of the popular construction material sandlime brick. The company has 200 employees and seven plants in Germany, as well as one in Switzerland. The conditions in the plant in Kronau are rough. Finished stone packages must be transported within the plant. This requires robust and sensitive heavy-duty lift trucks. The heavy-duty lift trucks of Heidelberger Kalksandstein must be able to stand the tough conditions of stone production and provide gentle help to make sure the stone packages travel safely from production to the warehouse and to the truck. The driver’s work should also be safe and comfortable. 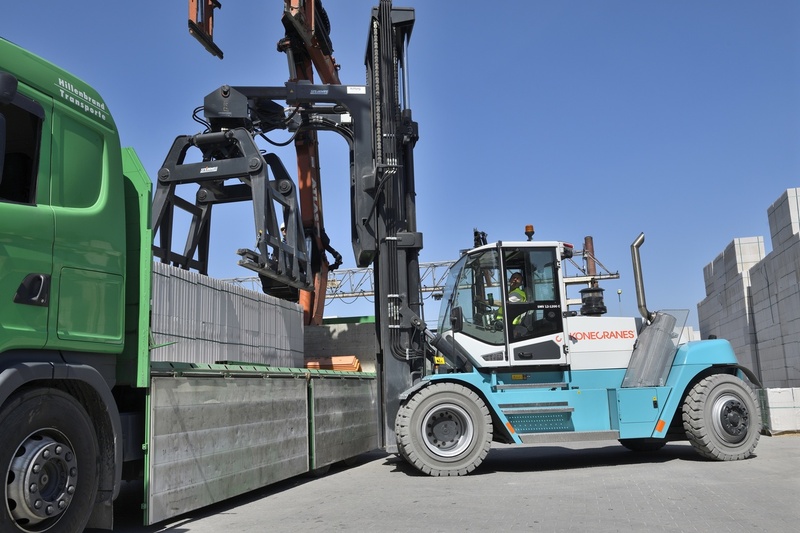 Konecranes Lift Trucks designs for Heidelberger Kalksandstein heavy-duty lift trucks with stone stack grippers made by SH Anbaugeräte. These special tools hold stone packages in a secure grip and are large enough to grab several palettes at the same time. The special lift trucks are also equipped with an electronic control system and the Optima cabin of Konecranes Lift Trucks. The latter offers drivers high levels of comfort and an excellent overview thanks to the strutless windscreen. The heavy-duty lift trucks SMV 12-1200 C are the first of the C series to be fitted with a stone stack gripper. They have a lifting height of more than 6.5 meters and a bearing capacity of up to 8 tonnes. The very wide gripper can pick up to five palettes with sand-lime bricks. An electronic control system keeps the driver informed about the hydraulically applied clamp pressure. Furthermore, the special lift trucks are restricted to a maximum of 12 kilometers per hour for safety reasons. Thanks to the specially developed stone stack grippers and safety functions, these robust heavy-duty lift trucks transport the sand-lime bricks safely and load them with great precision. In the noise- and vibration damped Optima cabin with air conditioning, DAB radio, and 7-inch touch monitor, the drivers have perfect overview of their machine and control it via joystick.